"Napoleon Bonaparte slept here" may not be the most unique thing a Mediterranean port of call could claim, but at least it's a small claim to French heritage. Such is the case for Malta, the tiny nation of three islands (Malta, Gozo, and Comino) at a very strategic spot in the Mediterranean -- between the northern tip of Africa and Italy, basically standing guard at the narrowest point between the eastern and western halves of the sea. Napoleon's forces occupied the small nation for two years, and since then it's mostly been under British rule/protection or, more recently, independent, but some of the effects of that two-year occupation can still be seen. Mostly, you see the effect in the social structure of the country. The French came in and drastically changed that, and most would argue for the better. It's important to make the distinction that the occupation lasted from 1798 to 1800, under General Bonaparte as part of the French Republican forces -- not after 1804 under Emperor Bonaparte as part of the Imperial French forces. This was when Napoleon was more of a populist than a power-hungry egomaniac. It doesn't seem like it was totally premeditated. In 1798, Napoleon and a force of more than 30,000 men sailed out from Toulon, on the southern Mediterranean coast of France, headed towards Egypt. The French wanted to resupply at Malta, but the Maltese, then ruled by the Order of Saint John (think Catholic knights) refused entry to all but two ships at a time, in order to retain neutrality. Napoleon bombarded Valletta, Malta's main city, and swarmed onto the islands within just days, starting an occupation that would last two years, with about 4,000 of the French soldiers remaining, while the man himself and the remaining troops sailed on to Alexandria. And so, the French came in and established a constitution. Though this has of course been modified and changed many times, Napoleon's version was the nation's first constitution, and the country hasn't been without one since. On these little islands, it was the French who also established the principles of: free, universal education; freedom of the press; freedom of speech; equality (for all men); religious freedom with the Jewish population allowed to build a synagogue; and the abolition of slavery, the nobility, the feudal system, and the inquisition. All of these have remained in place, or eliminated as the case may be, ever since. Given all the great things French did for the country, why would the Maltese revolt and drive them out after two years? The fact that the French defaced a lot of the traditional symbols of the knights' order and also took to seizing and looting church property, in order to get more funds for the Egypt expedition. Unsurprisingly, the British (along with the Portuguese and neighbors from Naples) came to help the Maltese fight the French, which not only allowed them to extract a surrender in 1800 but also resulted in Malta becoming a British protectorate then, essentially, colony. Because of its strategic location and British affiliation, it was used -- and harmed -- significantly during World War II. The island was awarded England's George Cross in 1942 in recognition of these sacrifices, and it's this cross that appears still on the now-independent nation's flag. The country became an independent member of the British Commonwealth in 1964, its own republic in 1974, and a member of the EU since 2004. As a place to travel, Malta is hot, dusty, and quite lovely in many ways. You can still see the British influence, too, and certainly that even more than the French, whose legacy is more infrastructure than culture (new motto idea: "French for Two Years, Napoleonic Forever"). The nation's largest church -- the St. John's Co-Cathedral in Valletta -- has naves dedicated to the nations which have contributed the most to Malta's heritage and history. One is dedicated to France, another to Provence (which we of course now think of as part of France anyway). You can see the influence in the decorations, especially the Fleur de Lys. It's actually a little hard to find these details amidst all of this splendor. If the French did loot the churches then either a) they didn't do a very successful job of it or (more likely) b) it's been quite well restored since then. ...and harbor towns that hint more than a little at neighboring Italy. Italian influence can be seen all over, including food like the local ftira (which is something like a flatbread pizza covered in potatoes), actual Naples-style pizza, risotto, and gelato. One of the coolest thing about this very hot little country is the history not just of the French occupation, or even the knights, but going way, way back. A mysterious civilization living here started, around 5000 BC, to build Megalithic Temples which can be found scattered around the islands. 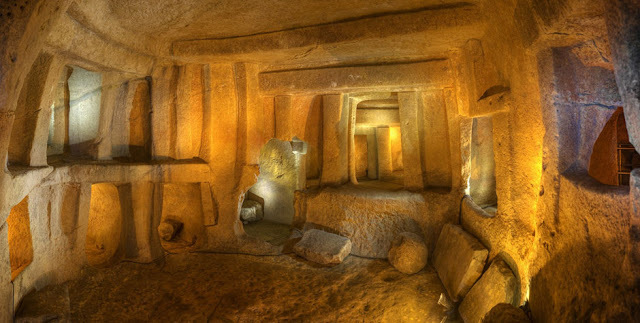 I get up early one morning and wait on line for a couple hours in order to snag very limited tickets to the Ħal-Saflieni Hypogeum, which is an underground, carved megalithic temple and really quite astonishing. We also visit Ġgantija, listed as a UNESCO World Heritage Site along with the Hypogeum and other Megalithic Temples of the islands in 1980. This is supposedly the oldest surviving free-standing (i.e. not a cave) building in the world. Yes, it's even older than the Great Pyramids of Egypt. No, it's not a coincidence that the name sounds like "gigantic" as more recent (yet still ancient) Maltese folklore attributed the building of these inexplicable buildings to giants. The name means "giants' tower" and given the size of the stones and antiquity of the society that built them, it seems like as plausible a theory as any. The temple building phase seemed to have ended, mostly, around 2000 BC, and civilizations collapsed and disappeared. But people keep finding their way back onto these islands. More recently, but still in ancient times, the islands were considered the setting for the Greek story of Calypso as told in the Odyssey by Homer. We see the cave on Gozo where legend says she held Odysseus prisoner for seven years during his epic journey. While I can't explain the technology used to move the massive stones, it's certainly easy enough to see where the ancients got the materials. The islands are just rocky everywhere, including under the water, with a tiny bit of chaparral landscape. At least the ancients didn't have to go very far to get salt. The salt pans are, like the rest of Malta, pretty hot, dusty, and thirst-inducing. Mostly, what draws people to the islands today is not the militarily strategic location. It's one of two things: for the ultra rich, the combination of tax haven and EU citizenship-for-a-price. And for the rest of us, it's the turquoise waters and the promise of a beautiful Mediterranean vacation. The base of this cheese, the Pecura, is a Corsican raw sheeps' milk cheese. Of course it's made from sheep milk, given the dusty, barren scrub of the Mediterranean islands, including Corsica (and Malta) and the lack of lush green cattle grazing pasturelands. This particular artisinal version is up there for the one of the more gorgeous cheeses I've seen, aged so perfectly and presented so beautifully in La Fromagerie de Kérouzine, a small cheese shop in the tiny town of Vannes that absolutely gets my vote as one of the best fromageries in all of France. Unlike its artisinal cousin, Pecura Balsamique, which is a balsamic-vinegar rubbed Corsican Pecura sold in Paris that I've previously tasted and written about, this Pecura Corsa, also called A Pecura Corsa in the Corsican linguistic tradition, is covered by a thick, gray and reddish, multi-hued, rocky crust that looks like I imagine the surface of Mars might look. 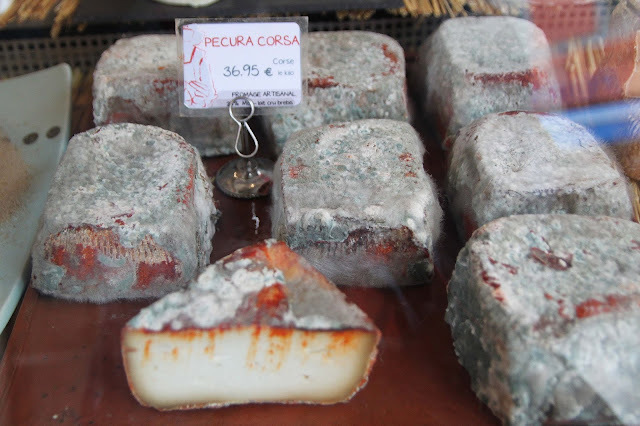 If you're not lucky enough to be at Kérouzine, you're likely to be confused about whether or not you've found this cheese, seeing as so many cheeses coming out of Corsica contain the word Pecura (Fior di Pecura, Casgiu di Pecura), the word Corsa (A Filette Corsa, Erba Barona Corsa), or both (A Nepita di Pecora Corsa), etc. It's generally a spring, summer cheese, and the flavor really comes through from the chaparral, that scrubby, brushy, dry and dusty, prickly landscape so inhospitable to nearly all mammals except goats or, in this case, sheep who, quite literally, eat it up. As you eat this hard cheese, you'll get hints of thyme, rosemary, and sunshine. I do, as a matter of habit/obsession, check out the cheese of Malta. Mostly, what I find and enjoy that's local is the Gozitan-style goat cheese, deep fried and served with some sort of chutney or jam. It's absolutely delightful. There are some local, simple, fresh cheeses, too -- also unnamed and of the goat variety. At our inn on Gozo where we stay for a week, there's a breakfast cheese platter every day with several French and French-style cheeses. In the end, there are two reasons I choose the Pecura Corsa for this post. One is the Napoleonic/French connection. Napoleon Bonaparte was, like this cheese, from Corsica. This made him both French and not-quite-French. While Corsica is technically part of France, it seems to identify mostly as a Mediterranean island in the same vein as neighboring Sardinia, Sicily, and the comparatively itsy-bitsy Malta. It also seems like the perfect cheese for this story because of the look of it -- the gray, rocky appearance juxtaposed with the brilliant splash of red. This ties together the cheese, the town where I tasted it in France (Vannes), and the landscape of Malta.